Mount Bischoff's tin-bearing cassiterite was discovered by James 'Philosopher' Smith at Tinstone Creek in 1871, and he found the massive Mount Bischoff orebody in 1872. 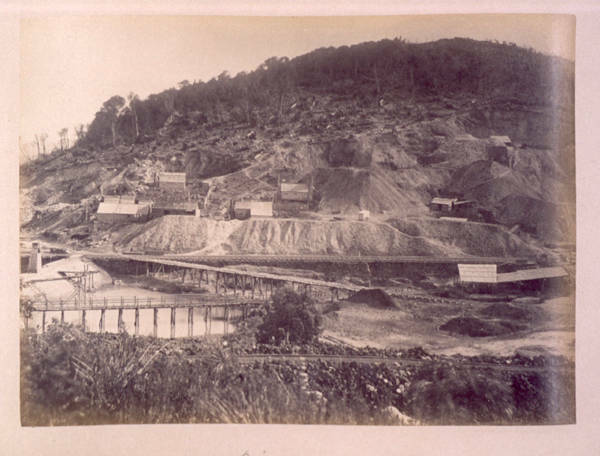 Smith was granted a lease, and mining commenced with a pick and shovel. The first loads of ore were taken by bullock carts over muddy bush tracks to Emu Bay. In 1873 Smith floated the Mount Bischoff Tin Mining Company, which became successful, paying a return of over tenfold on the initial investment. Smith did not make a cent, as he parted company with his fellow directors in 1876, before the first dividend was paid in 1878. Alluvial surface deposits were worked first, followed by the development of open cuts and then underground workings. The deposit has yielded 5,500,000 tonnes of ore from which 56,000 tonnes of tin metal has been extracted. Most was mined during the period 1873–1915. A tramway was built to the coast in 1879, and a railway in 1883. The Company built a smelter in Launceston in 1874, and a power station to supply electricity to the stampers in 1905. The mine was almost closed in 1915 due to a combination of lower ore grades, a low tin price and the inconvenience caused by some of the sulphide ore spontaneously combusting. Operation continued until 1929, when a further fall in tin prices made the mine uneconomic. Mining continued on a small scale, with the miners being paid with a portion of the ore they mined. The commonwealth government bought the mine in 1942, as tin was needed for the war effort. It closed finally in 1947. Since then a number of companies have shown interest, but no mining has eventuated. The geology at Mount Bischoff is complicated. The mineralisation has been caused by the intrusion of Devonian aged granites into much older Precambrian sediments. Hot metal-rich fluids containing tin, lead, zinc, boron, fluorine and other elements flowed into fissures in the host rock. The resulting precipitation and chemical reactions have produced an enormous variety of minerals. Over a hundred different types have been recorded from Mount Bischoff, making the area a haven for mineralogists and gem collectors. Further reading: N Haygarth, Baron Bischoff, Perth, 2004; M Godfrey, Waratah, Waratah, 1984.